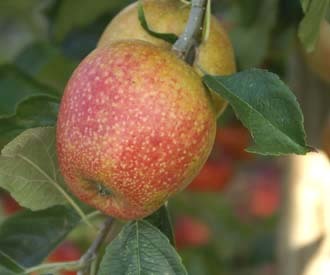 Adams Pearmain is an old English variety of uncertain origin. It was first brought to notice in 1826 by Robert Adams who had obtained the variety from Norfolk and referred to it as Norfolk Pippin. Other sources believe that it originated in Herefordshire where it was known as Hanging Pearmain. It was a popular commercial variety in Victorian England because of its handsome appearance. Medium sized, conical to long-conical fruit. Orange-red flush almost covering all the greenish yellow skin. 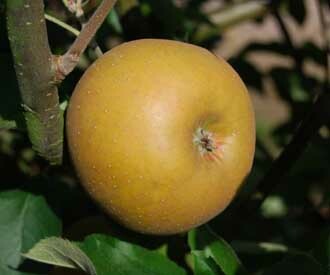 The skin is fairly rough with many light brown russet patches. Fairly dry, crisp, creamy white flesh. Nutty flavour similar to Egremont Russet. Moderately vigorous, spreading tree. Partial tip bearer. Good cropper but with some biennial tendency.